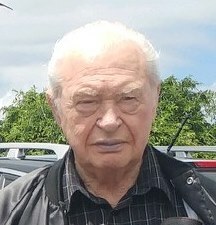 James M. Oden 76, Mentone, Indiana, passed away at 6:35 A.M. Thursday December 6, 2018 at Memorial Hospital, South Bend, Indiana. He was born May 11, 1942 in Chicago, Illinois, the son of Earl Richard and Mary Ellen (Warren) Oden. He served with the United States Army during the Vietnam War. On August 8, 1964 in La Porte, Indiana, he married Linda L. Masterson. She preceded him in death on August 12, 2010. Mr. Oden had worked as a truck driver for various companies over the years. He retired from Standard Forwarding, East Moline, Illinois driving out of the South Bend location. He was a member of Riverview Community Church, American Legion, #364 Teamsters of South Bend and former Moose Lodge member in South Bend. He enjoyed walking at the Y.M.C.A. in Warsaw, Indiana and eating out with family and friends at Martin’s, Warsaw, Indiana and Teel’s Restaurant in Mentone. Survivors include his children, Ellen M. and husband Ray Boardman, Rochester, Indiana, James R. Oden, Mentone, Indiana, grandchildren, Nicole Lin Boardman, Rochester, Indiana, Martin William Boardman, stationed with the U.S. Navy at Pearl Harbor, Hawaii,, Sarah Marie Baugh, Bloomington, Indiana, brother, Fred Oden, Rochester, Indiana, Companion, Judy Taylor, Rochester, Indiana, several nieces and nephews. He was preceded in death by his parents and brother, Jack Oden.